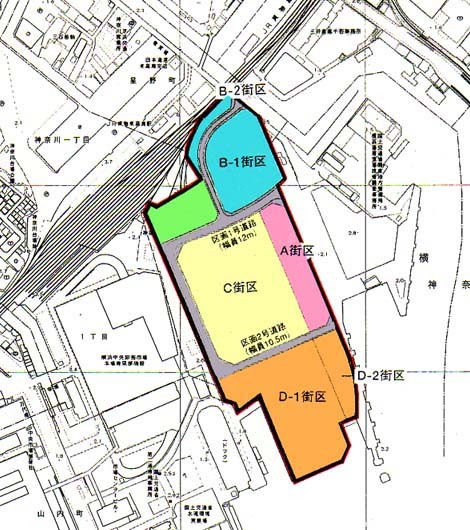 For the purpose of "planning the formation of composition function city area consisting of duties, commerce, culture facility or urban housing" in factory ruins of idled dock, we received indication of city reproduction emergency maintenance area in October, 2002, and our district started concrete town development located at the downtown area connected from Minato Mirai 21 district, Yokohama 京急バス district. We carried out land readjustment project by the association enforcement to plan the formation of composition city area by accumulation such as duties, commerce, urban house, culture, study function as leading business of Keihin seaside part that was adjacent again as new base in the downtown area of Yokohama and maintained bases such as road, park in district. City planning decision does city reproduction special district and city planning to land readjustment project to push forward premeditated town planning, and to plan the good city area formation and plans instruction of building. ※But the lowest of floor area ratio of building and the lowest of building area of building do not apply to 5 about necessary building in the public interest to prescribe from police box, public telephone place and 4 Paragraph 1 first of Article 130 to order. In addition, we offer, and height of the eaves is lower than 2.3m and height of the eaves does not apply limit of position of wall surface to use (except bicycle garage) to be similar to these storeroom or other.thing that the totals of length of outer wall or centerline of pillar as a substitute for this are less than 3m, 2 1 about things less than 2.3m thing that the total of floor space is less than 5 square meters, 3 in car garage.